The New International Version (NIV) of the Bible was published in 1979, the same year that I became pastor of my first church. Immediately, I liked how it was easy to read, yet more accurate than other popular, easy-to-read Bibles of the time, like The Living Bible and the Good News Bible. The NIV went through a minor revision in 1984, and I have been preaching primarily from the NIV ever since then, although I often quote other translations. 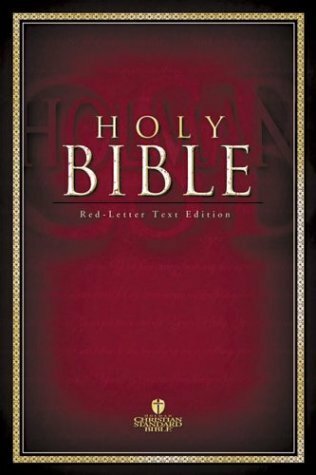 However, beginning in the summer of 2012, I will change to the Holman Christian Standard Bible (HCSB). Why the change, after all these years? The answer is simple: I’m changing, because the NIV changed. In 2011, the NIV went through a major revision, and the 1984 edition will no longer be sold in stores. The 1984 edition is not even available in digital form any longer for e-books like Kindle or Bible apps like YouVersion for your smartphone. If you buy a new NIV Bible or download the NIV, it will be the 2011 edition. The revision is more accurate in many places, correcting some translation errors of the old edition. However, the 2011 revision also chose to use gender-neutral language when referring to people, following the model of the New Revised Standard Version (NRSV), a translation that is owned by the liberal National Council of Churches. In some cases, the gender-neutral language is justified, as when the word “man” refers to all of humanity or when Paul addresses the “brothers” but clearly means all believers, “brothers and sisters.” But the 2011 revision of the NIV goes much farther than this, consistently using gender-neutral language even when the context does not necessarily call for it. I spent about a year carefully studying the 2011 revision, and although I liked some of the improvements in accuracy, the extremes of gender-neutral language outweighed the other improvements. Thus, I began to prayerfully look for another translation to use in my preaching. There were two main options I considered, because both are accurate translations, readable, and they avoid gender-neutral language unless the context clearly calls for it: the English Standard Version (ESV) and the Holman Christian Standard Bible (HCSB). The ESV is a great translation. It is a conservative response to the New Revised Standard Version (NRSV). The NRSV uses gender-neutral language, while the ESV does not. The ESV is very close to the New American Standard Bible (NASB) in accuracy, and it flows better than the NASB. However, I chose the Holman Christian Standard Bible (HCSB) over the ESV, because the HCSB uses more contemporary language than the ESV. For example, while the ESV uses “behold,” the HCSB says “look!” and while the ESV says “made manifest” the HCSB says “made evident.” The HCSB is as readable as the NIV, while it is more accurate than the NIV. The HCSB translates the name of Yahweh in the Old Testament in places where the context implies God’s name (rather than the all capital “LORD” used in other translations). It translates “Christ” as “Messiah” in the New Testament when the context is referring to Jesus’ title as Messiah. It shows respect for deity by capitalizing pronouns when referring to God. That is why I have been using the HCSB in Wednesday night prayer meeting for several years, and beginning in the summer of 2012, the HCSB will become my primary Bible when preaching on Sundays. Am I saying that I expect my congregation to go out and buy a Holman Christian Standard Bible? No, I am not. This decision is for my own preaching, as I feel a responsibility to preach from a Bible that best communicates God’s Word with clarity and faithfulness to the original languages. Everybody is welcome to bring to our church whatever translation of the Bible you prefer. If you want to continue using your NIV Bible or other favorite translation, you are welcome to do so. It is useful to compare various Bible translations, and although I will primarily preach from the HCSB, I will continue to quote other translations of the Bible in my sermons whenever it sheds light on the meaning of God’s Word. If you wish to sample the HCSB, you can download it for free on the Kindle at amazon.com and the Nook at BarnesandNoble.com, and the application “You Version” has the HCSB available for free on smart phones and iPads, available at http://www.youversion.com. The website http://www.mystudybible.com is a free website using the text of the HCSB, including excellent Bible study notes in the margin. The HCSB translation is used in Sunday School literature printed by LifeWay. Our church will also place HCSB pew Bibles in the worship center for the convenience of those who wish to follow the same translation as the pastor. Here are some sample comparisons of the 1984 NIV, 2011 NIV, and the HCSB. NOTE: If you see a video ad below this post, please be aware that I have no control over which ads appear here, and I do not necessarily endorse the product. In March 2011, the copyright owners of the most popular modern translation of the Bible in English, the New International Version (NIV), published the first revision of the NIV since 1984. As a pastor who did not like the over-reaching political correctness of the Today’s New International Version (TNIV, copyright 2002), I was concerned when I heard that the NIV itself was going to be revised. But after studying the digital early release version in numerous passages, I have been pleased that it is more accurate, but disappointed that while the use of gender-neutral language does not go as far as the TNIV, it still goes too far. The new NIV retains 95% of the words of the 1984 edition, but where there are changes, it communicates the original meaning better to modern readers and more accurately than before. Let me address several issues: gender-neutral language, omission of words, and accuracy of translation. The 2011 NIV changes “fathers” to “parents” in Malachi 4:6, although the Hebrew word is ab, fathers. Also, Ezekiel 22:30, the famous “stand in the gap” passage used by Promise Keepers to challenge men, has been changed from “man” to “someone.” A favorite verse of the men’s group, Promise Keepers, was Proverbs 27:17, because it said that as iron sharpens iron, so one man sharpens another. However, the 2011 NIV changes “man” to “person.” These kind of changes can be found hundreds of times throughout the Old and New Testaments in the 2011 NIV. The second translation issue is the omission of words. One of the biggest criticisms of the 1984 NIV was that sometimes words in the Greek text simply were not translated. The most notorious example was the Gospel of Mark, which makes frequent use of the Greek word euthus, “immediately.” For some reason, there were many verses in the 1984 NIV that simply ignored this word. But the 2011 NIV is careful to translate it as “immediately” or “as soon” etc. in every place where it is used. I have been doing a verse-by-verse study of Romans in the Greek, and comparing the old and new versions of the NIV, I found that where the old NIV omitted the word “or” at the beginning of Romans 3:29, the new NIV restored the word. And in Romans 4:1, the old NIV omitted the words “according to the flesh,” but the new NIV put the phrase back in. In Romans 8:4, the 1984 NIV says that Jesus’ sacrifice satisfied the “righteous requirements” of the law. However, the Greek word translated “requirements” is singular. The 2011 NIV changes it to the singular “requirement.” This might seem a minor distinction, but theologically the singular implies that God covers the entirety of our sin, not just some sins. Different readers will have different opinions about the appropriateness of gender-neutral language in the revised NIV. Some will like it, and others will not. Personally, I can understand the change to “brothers and sisters” or “mankind” when the context clearly refers to all people, but when the context is not clearly gender-neutral, the translation should not be gender-neutral. It is unfortunate that this issue may cloud the discussion of this revision, which is otherwise more accurate than before. People who love the NIV and do not object to gender-neutral language should embrace this revision with even more confidence in its accuracy, and people who object to the gender-neutral language will prefer translations such as the Holman Christian Standard Bible (HCSB) or English Standard Version (ESV).